Geron Williams is once again the national road race champion. 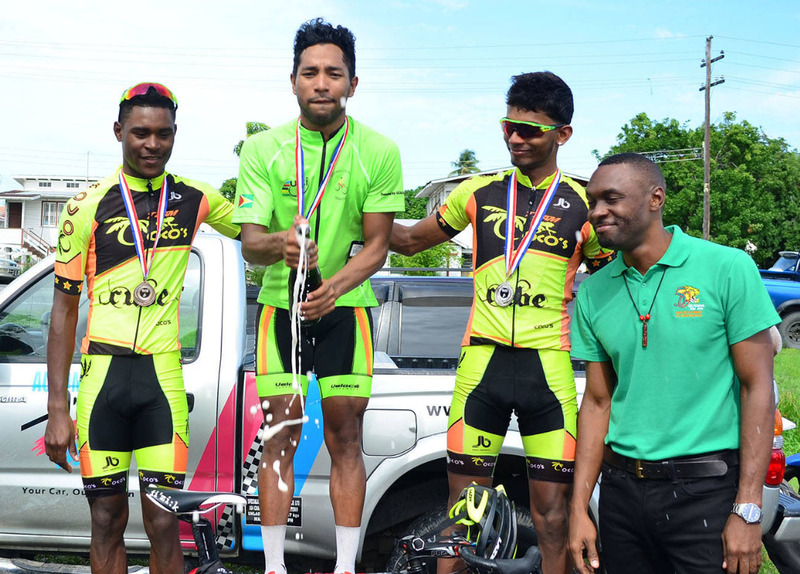 Yesterday, the US-based wheelsman denied Raynauth Jeffrey a second senior road race title while claiming his second one in three years as he out sprinted the Team Coco’s standout at the end of an aggressive day of racing around the outer circuit of the National Park. Jeffrey, who earned the Time-Trial trophy one day earlier, was one of the favourites of the 32-man star-studded starting peloton. 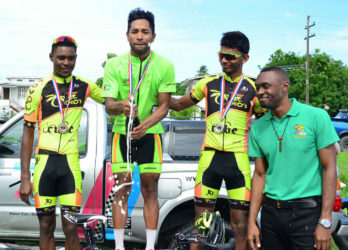 But the tireless Williams, who won the gruelling event in 2014, had enough left in the tank to once again emerge winner of the annual flagship event of the Guyana Cycling Federation (GCF). Jeffrey, who has been campaigning on the US circuit and in Colombia, was aggressive early on and in the latter part of the flat 75-mile (30 laps) course, sparking various moves in a fluid opening portion of the race. Then, with 10 laps to go, the work horses, Jeffrey and Williams opened a sizeable lead on the chasers much to the delight of the vocal fans strung along Irving Street. 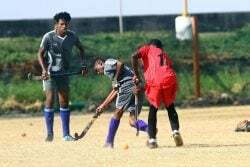 From there on it was essentially a two-man race and the duo both clad in black and neon green were like Siamese twins, going saddle to saddle and constantly attacking each other in an effort to be crowned champion. In the final five laps, the 2013 winner, Jeffrey, affectionately called ‘Obeah Man’ attacked repeatedly like a man possessed, but Williams, gambling on it coming down for a sprint, shut down his every move. After relative calm in the final lap, all bets were on Williams the superior sprinter. As the two riders banked north into Irving Street from Thomas Lands, Jeffrey rose from his saddle in a last ditch effort to regain the coveted trophy but Williams found another gear about 100m from the line and blew past Jeffrey for the win by about six bike lengths in two hours, 42 minutes and 44 seconds. The 26-year-old punched the air and celebrated as he crossed the line for what is probably the biggest result of his career. Not only did Williams upstage Jeffrey, but he also bested last year’s winner Hamza Eastman and US based Scott Savory. 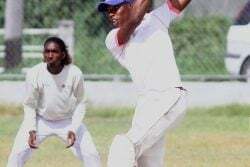 Savory is the fastest man in the New York Tri-State area and 2016 Tour of Somerville champion, the first Guyanese to lay claim to that honour.